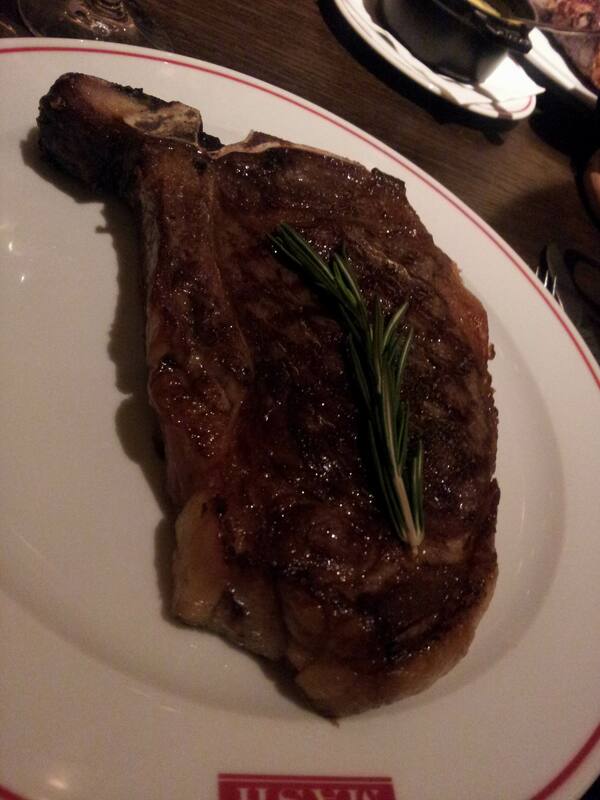 A steak that would mash your insides: Getting our beef on at MASH | Boy Mestizo: Hoy, London! Well, that was a filling meal. Stuffed right to the gills, rolling out of there like a tubby barrel, groaning at the sides; I’d been MASH’ed. Let’s rewind a bit. My dad wanted to take me and my brother out for a nice steak meal, and after scoping out a number of different places, finally settled on MASH. MASH, if you don’t know, supposedly stands for Modern American Steak House, but rather confusingly has come to us via Denmark, but fear not – this was a thoroughly American evening. Your first impression is shaped by the rather spacious and grand lobby you enter at street level, guarded by an imposing bouncer and overseen by an ever-smiling receptionist of sorts. Once she took my details, she informed me that my party were waiting for me downstairs, but what she didn’t mention was that there would be two waitresses waiting there too, greeting me by name and shepherding me to my seat. So far so good. Your second impression is formed by the cavernous space that greets you as you enter the bar and main dining room. All decked out in Art Deco and illuminated by warm lighting, the area is truly impressive. How did they get such a big basement, with such high ceilings, right in the middle of Soho?? You could spend a good few minutes just looking around, soaking up the atmosphere and imagining you were in 1930’s New York, as smooth jazz tinkled over the sound systems. Your third impression is coloured by the large racks and chunks of beef hanging to dry in their airing cupboards separating the bar and the restaurant. I won’t go so far as to say that I am astounded and wowed by raw meat (a childhood spent around the wet markets in Hong Kong can have that effect upon you), but I was still fascinated by the way that they were being presented almost like pieces of art. Pieces of succulent, tender, meaty, art……. Ahem. So, let’s talk food. Let’s talk STEAK. I opted for the bone-in N.Y. strip (approx. 600g), culled from IBP prime, Nebraska cattle. For those uninitiated to what this means, N.Y. strip is cut from the short loin and is a rather tender piece of meat, being from a little-used muscle; it was also described to me by my brother, steak expert that he is, as like the bigger half of the T-bone steak and with a bit more fat to it. And as for IBP prime, Nebraska, “this certified and hormone-free, corn-fed beef is as tender and flavourful as you can imagine”. As far as I was concerned, it was a wonderfully tasty steak that had no need of sauce. Cooked perfectly to rare, it was extremely succulent and not hard to chew through. But I must reserve highest praise for the fat lining the edges of the N.Y. strip – never have I had fat that melted that easily in my mouth. None of this horrible stringy and chewy fat that I can picture very clearly on that Slug & Lettuce steak a colleague had down in Poole (*shudder*); it actually felt socially acceptable to eat fat this luxurious. All in all, I was very happy with my choice of steak; I think we were all happy with our choices, my brother and my dad contented as they were with the long-bone ribeye (Danish beef, dry-aged for 70 days. 70. DAYS. I did not know you could age beef for that long). As for sides, I accompanied this with macaroni and cheese (rich, thick and creamy) and creamy spinach (creamy, unsurprisingly). And, since the 600g of steak had quite properly finished me off, all that was left for me to have for dessert was a richly sweet glass of 2008 Patricius “Katinka”, Late Harvest Tokaji. What a perfect way to end an evening of gluttonous steak eating. Why you gotta hurt me like that? 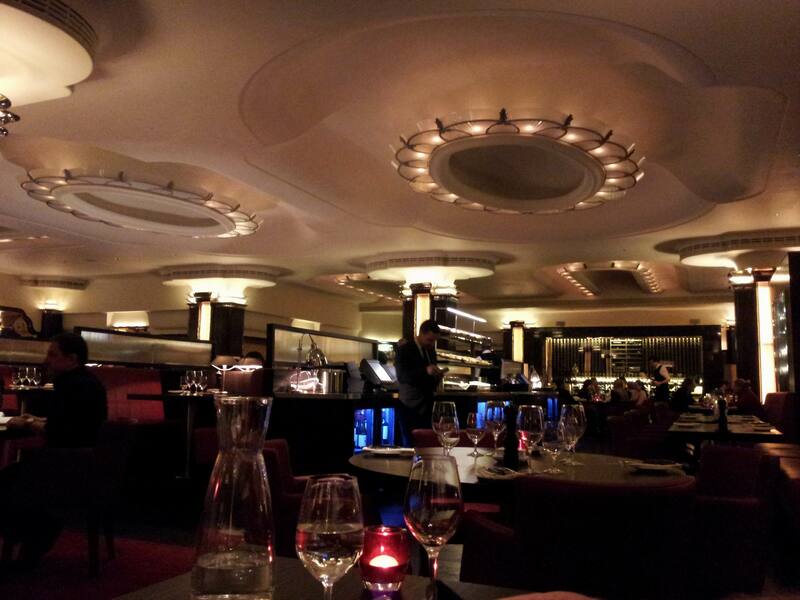 VERDICT – A good place. It’s a rather impressive venture, all the way from the extremely friendly staff to the atmosphere and décor and to the well-executed steaks. 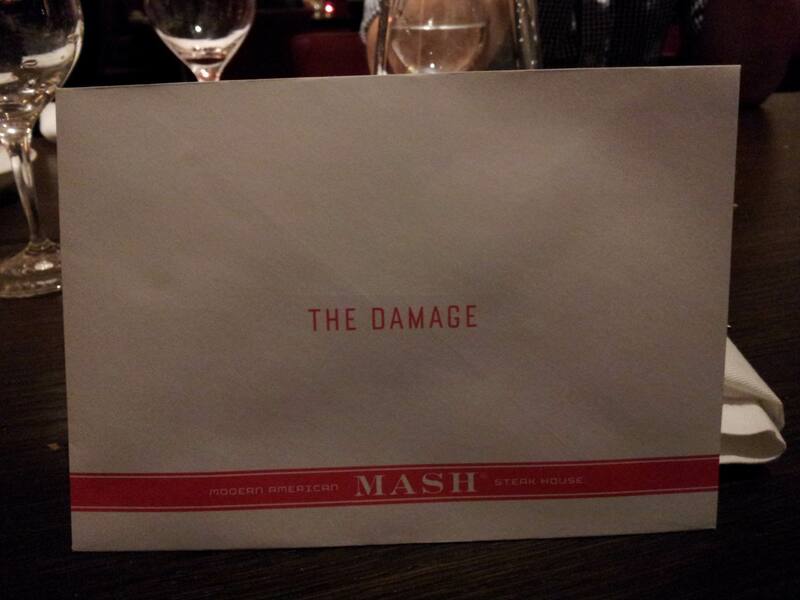 Rather cheekily, they delivered the bill to us in an envelope labelled “The Damage”, but I think that just topped off what an enjoyable evening it was, where a father was able to take his two darling sons out for a ‘simple’ steak dinner.